Where to stay in Venice ? I have selected a handful of the best three and four star hotels in Venice Italy... and a boat! Considering the small size of the city there are probably more hotels per square foot in Venice than anywhere else on earth. The bad news is that most are overpriced and many offer poor service. That's why I have so few 3 and 4 star hotels on my site. I only feature hotels I know personally and that I've loved. I know you want your time in Venice to be special so it's essential to find a great hotel that won't cost a fortune. Three and four star hotels not for you ? 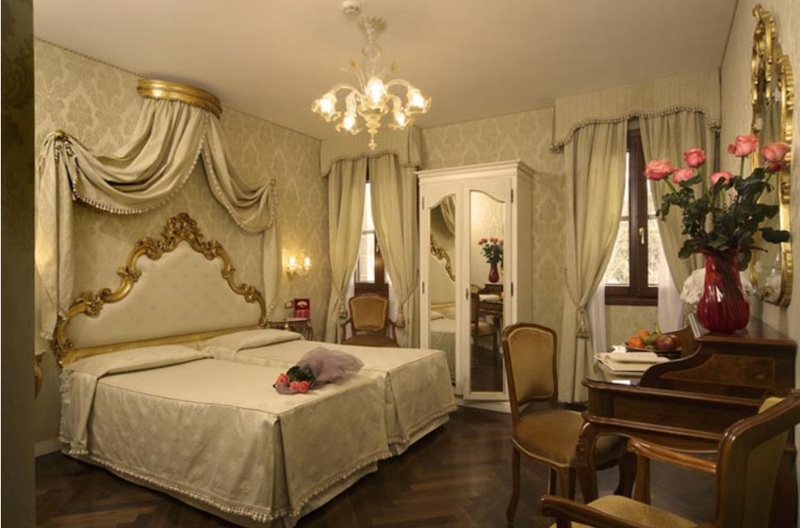 Need absolute luxury and to feel like Venetian nobility? Then visit our guide to the best of Venice's luxury hotels. 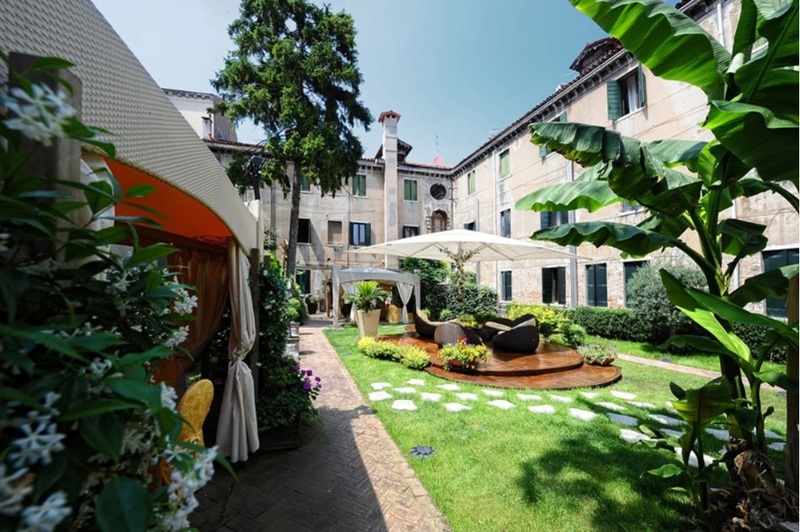 For hotels in other areas of the Veneto click here. This summer we decided to add another hotel to our selection. We visited lots but none were good enough. Then we decided to give this one a try based on a number of emails from site visitors . Wow...we loved it! Here's our review and photos. Housed in what was once an ancient Abbey. 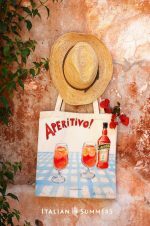 The Hotel Abbazia is a warm, friendly hotel and well situated too. 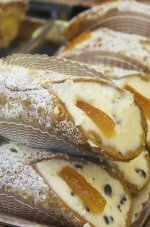 Most of the staff speak fluent English and are always full of smiles, which is not always the case in Venice. For more reviews and booking details click here. 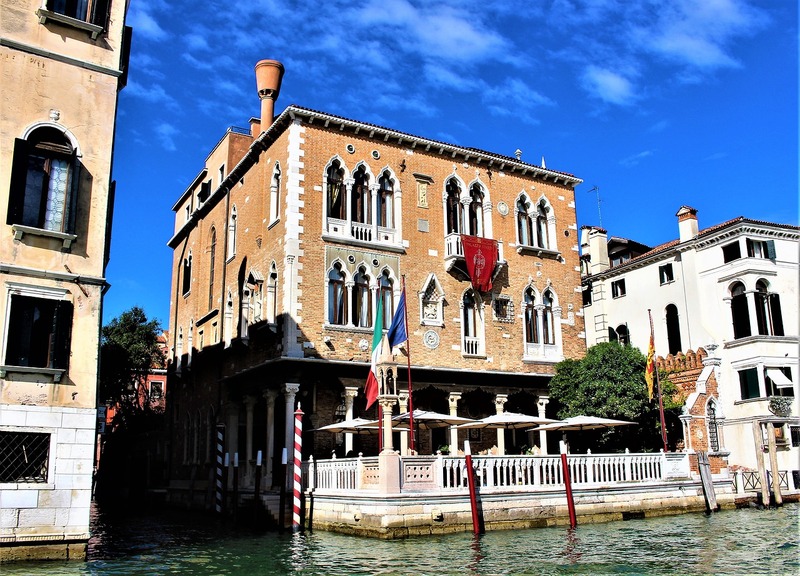 A relatively new Hotel but this could well be the best choice when it comes to three star hotels in Venice. Perhaps it is the newness, or the high standard of furniture and service, but it really felt more like a four star hotel to me. The location is superb too – only a few minutes walk from St. Marks Square. It seems I am not alone in loving this hotel, the reviews on Booking.com rate it as absolutely fabulous. To see these reviews and for booking details click here. Good location, great breakfasts and spotlessly clean rooms. The Locanda di Orsario is not very big, and is too small to be rated as a hotel, but it is a great choice and rates are very reasonable. I don't know about you, but I often prefer smaller and friendlier places anyway and this is ideal. 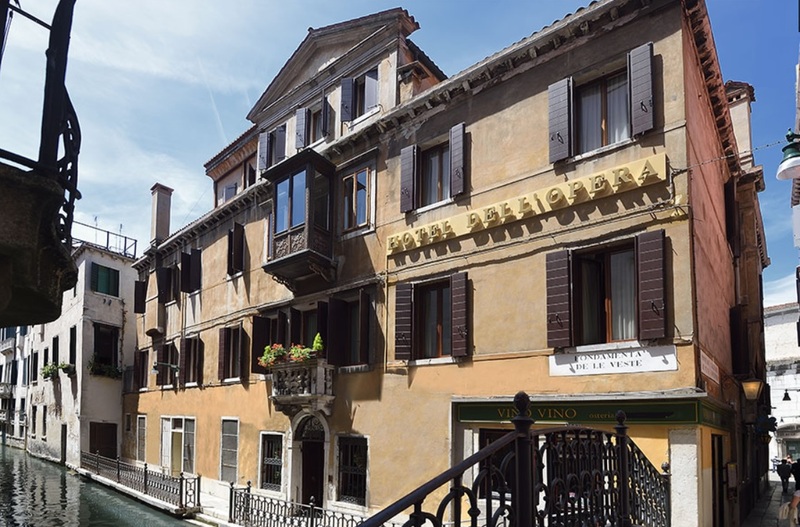 Owner Pietro and his family are sure to make your stay in Venice special. For more reviews and booking details click here. Once the home of 16th century nobility but now a really excellent four star hotel. Everything is right about this hotel and the price is that of a three star hotel. I don’t know why they charge these rates in Venice when most others charge exorbitant prices but I hope it stays like this. For more reviews and booking details click here. I'd stay here just for the view from the breakfast table. I mean look at that view! Ask for a superior room, with a view of the square, and you'll be in heaven. Other reasons to stay here? Well the location on the doorstep of St Mark's is unbeatable and I've always been greeted with big warm smiles from the baggage guy through to Guliano the concierge. Find out more about the Concordia here. Good hotel with one of the only and one of best bacon and egg breakfasts in Venice (you'd be amazed at how many people write to me to complain about only getting offered pastries for breakfast). The hotel has some of the biggest rooms in the city too, most overlook the Grand Canal but if you really want a great view try the Jacuzzi on the rooftop terrace. For more reviews and booking details click here. Make this lovely yacht your home in Venice. 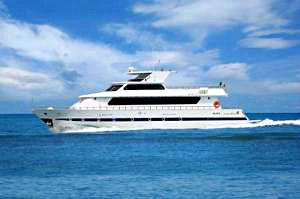 The Sarah Sun Island offers great views from her moorings. Breakfasts served on the upper deck are a great way to start the day while watching the colorful morning traffic on the Grand Canal. Find out more here. 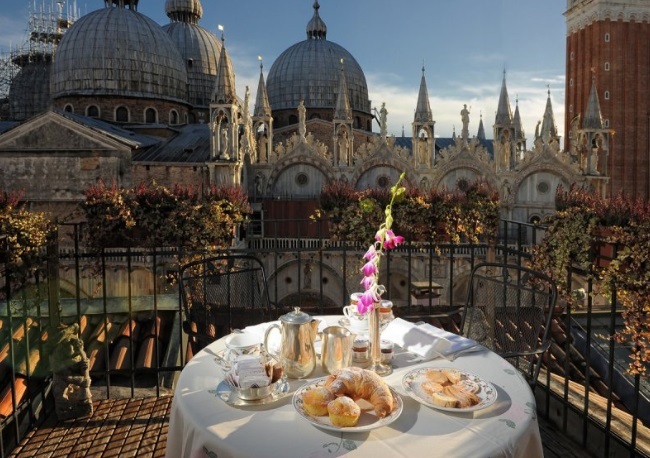 For our pick of the best luxury hotels in Venice please click here. 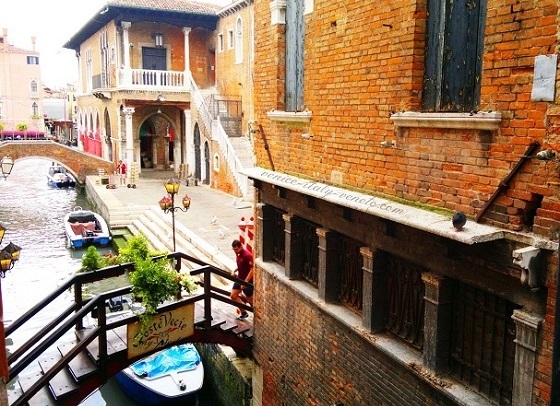 For the loveliest Venice vacation rentals click here. 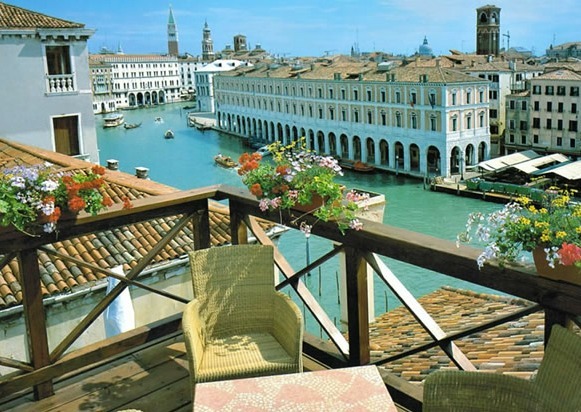 For more hotels in Venice Italy or for hotels in other areas of Italy please use the search box below. What's your Hotel Tip ? 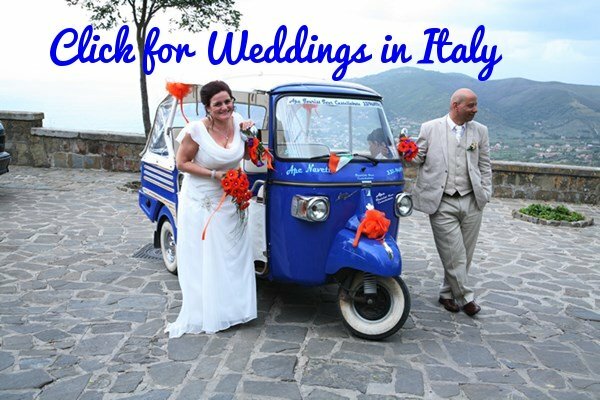 Have you ever been to Italy? Share a little about the place you stayed. Good or bad we would love to hear from you.